Want to learn some scales on bass guitar but don’t know where to start? I’ll share the best bass scales for beginners to learn. It can be a little intimidating figuring out where to begin when it comes to learning scales on bass guitar since there are so many. The simple truth is that there are only a handful of scales that make the biggest difference in your playing. And the best part? They are easy to learn! These scales form the foundation of every other scale and chord you will ever learn and they were the starting point for the best bassists in the world. If you have a terrible memory like me and have a hard time memorizing scale fingerings, you’ll be happy to know that 3 of these are just slight variations on the major and natural minor scales! Why Do I Need To Learn Scales? You can think of scales like a list of the notes that sound good with a particular chord, chord progression, and the corresponding key in which they reside. If you want to be able to pick out notes that sound good with a backing track or your band, knowledge of scales is essential. The more you practice scales, the easier you will learn to mix them together and see the relationships between all of them and the moods they convey. In more complex music like jazz for instance, it’s common to play a different scale for each chord in the progression. 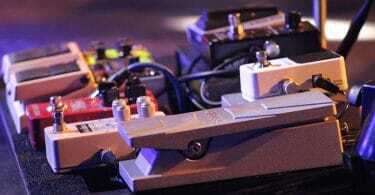 It can be immensely helpful to grab a looper pedal to help learn improvising. Just lay down a simple repeating backing groove using the note of whatever key you're in, and then jam over top of it using notes from the scales below. This will help you learn the "flavor" of each scale, and you'll be creating your own music! Learning to walk all over the fretboard while practicing scales will allow you to learn licks and songs easier since you’ll be comfortable with finger stretching and landing on notes properly. Who do you think will be able to play a fast tricky bass line with more ease and with their eyes closed - Someone who has practiced scales a thousand times? Or someone who hasn’t? The ease at which you move across the fretboard is directly related to the strength in your fingers and how much time you’ve put into practicing things like scales. Every scale has its own unique sound and musical purpose. Scales can sound exotic or simple. They can also be used to create tension and release. When you need to create atmosphere and moods in the music you write, scales are the tool of choice. Without them you’ll be essentially writing in the dark. 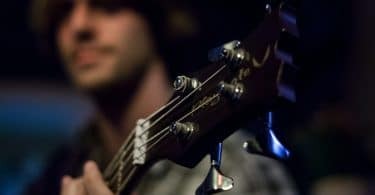 As a bassist, your number one priority other than keeping good time is to choose the right notes to support the chords. Since all chords are built from scales, it is essential to have a good foundation in scale knowledge. With scales under your belt, you should be able to look at a chord and know exactly what notes on the fretboard go well with it and which don’t. Knowledge of the basic scales will take you a long way, then after that it's time to take some more advanced bass lessons. Scales are the building blocks for all music theory. If you want to understand chords, modes, progressions, triads, and pretty much anything else, you will need to have a solid grasp of the basic scales. It's something you should try to work on a little bit each day, and you can even practice without an amp. The Major scale consists of 7 notes. It’s the most common and most important scale in all of western music and the first thing any musician should learn. It is considered to have a happy feeling to it when heard. In the key of C, it’s all the white notes on the piano - C, D, E, F, G, A, B. You may have also heard people sing Do, Re, Mi, Fa, So, La, Ti, Do. This is referring to the major scale. In the case of the C Major scale listed above, the first note (the C) is considered the “root” note, or the 1st. The root note is what the key is in. The D is then considered the 2nd, the E is the 3rd, and so on. Once you reach the end, the root note is played again just up one octave, and the cycle continues from there. So now if I told you that a major chord is just the root, 3rd, and 5th played together at the same time, you would know that a C major chord would be C (the root note), E (the 3rd note in the scale), and G (the 5th note in the scale). That is a bit beyond the scope of this article but it’s good to know! If you are interested in doing a deep dive into the world of music theory beyond the scales taught in this article I’d recommend Music Theory for the Bass Player by Ariane Cap. It’s how I learned and it’s by far the number one thing I always recommend to other bassists. Now let’s take a look at how to play a major scale on a bass guitar! In the beginning, it’s easiest to break scales down into little shapes you can memorize. These shapes repeat all over the fretboard and once you learn one major scale you will instantly be able to play every other major scale across the fretboard by keeping these patterns in mind. The red notes are the root note. Try to memorize this pattern - it’s important! Pick up your bass and try playing it up and down starting and ending on the root notes each time. Use a metronome! It’s very important to start and end on the root note when doing these exercises so that you can establish what key you are in. If you start and end on a different note of the scale (like the 2nd for example) it will sound like something completely different since you are establishing the 2nd as the root note. This is called a “mode” and is an advanced part of music theory you should come back to at a later date! Now instead of starting on the A on the thickest string, try starting on any other note and play the same exact shape as before. You are now playing the major scale of whatever root note you chose. Congratulations, you can now play the major scale in every key! Same thing as before - memorize it, play it up and down a few times, and then try playing it all over the neck. You’ll notice that it sounds exactly the same. It’s the same notes, just in a different location. Try sticking with 1 key (A for example) and alternate between playing patterns 1 and 2. The more patterns you can recognize and connect, the easier you’ll be able to navigate all over the fretboard eventually. The self discovery and experimentation of these patterns is what will allow you to excel in learning scales. See how many little patterns you can find and master over the next week. Stick with 1 key and 1 set of patterns until you can master it, and then start slowly adding in other patterns and finding where they connect. Once you feel like you can effortlessly play the A major scale notes anywhere on the fretboard, it’s time to try out some different keys. It’s the same shapes and patterns, just starting at a different place! The Major Pentatonic scale is easy to learn if you think of it as a variation of the major scale. All you have to do is remove the 4th and 7th notes and you are left with the 5 notes that make up this scale. The pentatonic scale is considered home base for improvisers. The reason for this is that all the notes just sound good no matter what. Musicians in the past would make millions of dollars just by sticking to the pentatonic scale, and it’s one of the first scales guitarists learn. If you have a piano nearby try playing all the black notes. This is the F-sharp major pentatonic scale and you’ll instantly hear how pleasant it sounds. The scale has a simple and bright feeling to it, and it works well when played over most major chords in the same key. Try to find repeating patterns and see how it comes from the major scale. The Natural Minor scale is handy for beginners because it’s very foundational and good to base other minor scales off of. The best part is that if you know the major scales you already know all of the natural minor scales! All you have to do is take one of the major scales and start and end on the 6th note in the scale. For example if you take the C major scale (C, D, E, F, G, A, B) and play it up or down starting and ending on the 6th (A in this case), you’ll hear that it sounds quite a bit different. Minor scales have a bit of a darker and sadder feeling to them. The notes are exactly the same as the C major scale, but since you are establishing the 6th note as the new “root” it has a different sound to it. The 6th note in a major scale is therefore referred to as the “relative minor”, since if you use it as the root the scale becomes minor. It is also called the Aeolian mode, whereas just the normal major scale is referred to as the Ionian mode. Just like the Major Pentatonic is easy to learn as a variation of the major scale, the Minor Pentatonic scale is just a slight variation on the Natural Minor scale and consists of 5 notes. Simply remove the 2nd and 6th notes. Again, this is a great scale for improvising with since pretty much any note you hit will sound good when played over a minor chord in the same key. The Blues Scale is nothing more than the minor pentatonic with 1 added note. This note is called the “blue note” and it adds a certain flavor and sound commonly heard in blues, although it’s also commonly heard in rock, jazz, and funk. All you have to do is take the minor pentatonic scale and add a note in between the 4th and 5th. Go ahead and try adding bass to this A minor blues backing track. Stick with the A minor blues scale and it will always sound good! Don't go overboard with the blues note though - try and use it sparingly as it will add to the impact of it. While scales are a necessary part of every bassists arsenal, chord tones are equally as important to understand. A chord tone is just a note that exists within a chord. For example in a C7 chord the notes are C, E, G, and Bb. Those are also the chord tones. To create the strongest supporting bassline over a chord it's a great idea to stick to the chord tones. Sure, you can dip into a relevant scale a little bit, but emphasizing the chord tones will ensure that you are supporting the chord to the fullest. For example with the C7 chord in the background you could play the Mixolydian scale (C, D, E, F, G, A, and Bb), but some of those notes are not found in the C7 chord and might not sound great when played depending on the context. It's better to stick with chord tones for the most part and then use the supporting scales to occasionally add in outside notes to give some extra flavor to the groove. This site is great for quickly finding whatever guitar chords or scale you want. You can just set it to standard guitar tuning and ignore the high B and E strings if you are using a 4 string bass. JamPlay really is heaven for guitar and bass players of all types. You’ll find countless lessons from some of the best bassists in the world today, and they come packed with tabs, slow motion video, progress reports, scale libraries, jam tracks, and much more. There really is a lesson for everything here. Go and try it out for a month by signing up here! I’m not usually one to recommend this game for learning how to play bass, but I have to say the scale exercises and mini-games in this are a ton of fun. The fact that you use a real bass guitar to play makes is a viable practice option. If you’re not familiar with it, think of it as Guitar Hero but played with your own real instrument. Just hook it up with the included Instrument-USB cable. The note detection is actually pretty good, and you get the sounds of the real amps from inside the game. In addition to the many songs you can play along with, there are lots of mini-games like Scale Warriors, and Scale Racers. I feel that if you can find a way of making practicing fun, it can’t hurt your playing. It doesn’t beat sitting down and analyzing the scales and practicing patterns, but something like this is great for getting more comfortable with your instrument and having fun while doing it. Check out Rocksmith here on Amazon. Just select what system you use (PC, Xbox, or PS4) and you are good to go!